So I had bunches of basil I got at the Green Market this Saturday. At $1.50 a bunch, I had no choice but to buy two huge bundles. My sister turned me onto pesto several years ago, and I've made it a couple of times since then. She, on the other hand, has mastered it and turned it into a fine art. She makes all kinds of pesto using all kinds of clever and creative ingredients. I've been fortunate to sample a few of them and they're all delicious. On one of my recent visits she made the most incredible dish using farfalle and vegetables mixed with the most incredible sun-dried tomato pesto. She's an artisan who puts my feeble efforts every couple of years to shame. 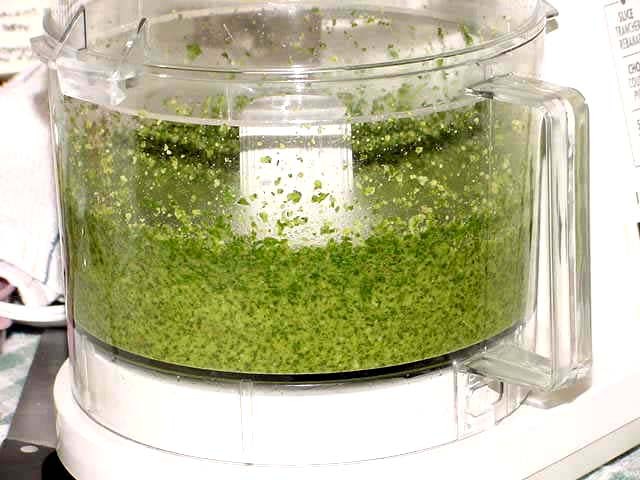 But still, every once in a while, the pesto songbird sings it's sweet tune and I'm inspired to get out the food processor. 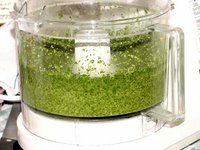 The general way to serve pesto is to cook up a pound of pasta, drain it, and add the pesto while the pasta is hot so the pesto melts into a wonderful sauce. But I'm still playing around with the absorption method of cooking pasta, so I've been cooking up a single portion of pasta and taking it to work with me, with a little bit of pesto in a separate container. I also have some cooked chicken in the fridge, and I've been putting a little bit of that in there too. It's a nice treat in the middle of the day. My sister gave me this recipe years ago. She has adapted it a millions ways to Sunday since then, but I follow it pretty closely and it's mighty fine just as it is. 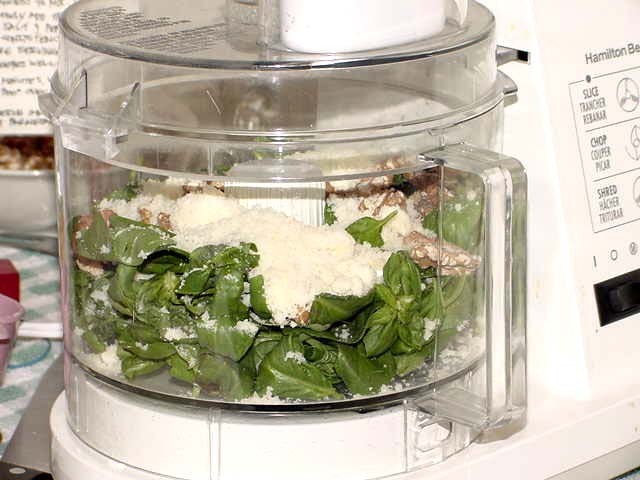 Combine basil, garlic, cheeses and nuts in food processor or blender. Process to mix. With machine running, slowly add the oil. Season to taste with salt and pepper, and process to desired consistency. Let stand 5 minutes before serving. Toss with hot pasta and serve immediately. Makes 1 cup; freezes well. *Loosely packed. Be sure the leaves are completely dry or your sauce will be runny. **You can use less, but I wouldn't go lower than 1/4 cup. Am I Blue? You Bet! Eggs . . . Cheese . . . Chives . . .